"Where will we get enough food to feed all these people?" "Don't you know that it would take almost a year's wages just to buy only a little bread for each of these people?" "There is a boy here who has five small loaves of barley bread and two fish. But what good is that with all these people?" the crowd. Jesus took the bread in his hands and gave thanks to God. them up and filled twelve large baskets with what was left over from the five barley loaves. "This must be the Prophet who is to come into the world!" Jesus realised that they would try to force him to be their king. 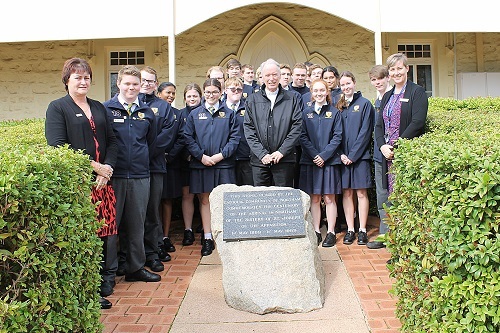 So he went up on a mountain, where he could be alone..
Today, it was with great pleasure that the School hosted a visit from The Most Reverend Donald George Sproxton, Auxiliary Bishop of Catholic Archdiocese of Perth. 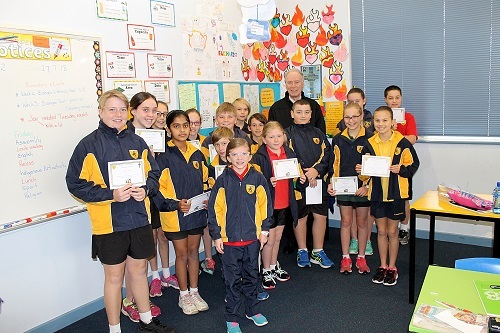 Bishop Sproxton spent time on the Primary Campus where he attended the Year 2 Assembly, handed out awards that recognised the completion of the MaJEC Program, and visited all the Primary classrooms. 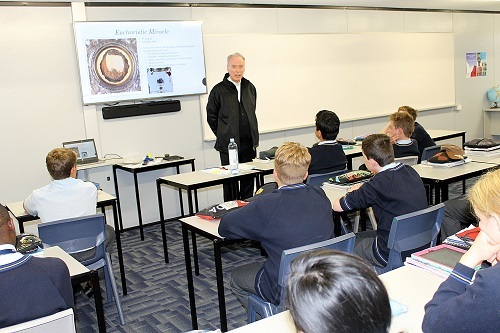 Bishop Sproxton spent the afternoon on the Secondary Campus with staff and students and was very impressed with those that he spoke with during this time. Thank you to all staff who were involved in the organisation of the day. Thank you to Ms Marino, Mrs Dymnicki and the Year 2 class for a fantastic Assembly today. 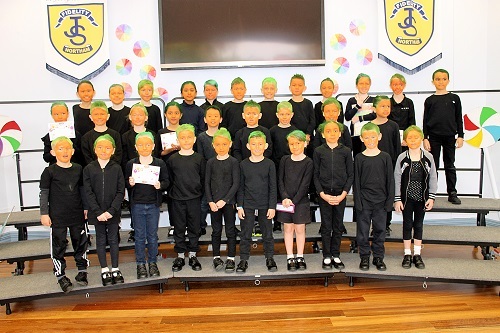 The students presented work done in class on the Roald Dahl novel, ‘Charlie and the Chocolate Factory’, which saw the class dressed as the Oompah Loompah’s. Great work, Year 2’s, on a very polished performance! Thank you to staff and parents for the Parent/Teacher/Student Interviews that were held on Thursday 26 July on both campuses. It was wonderful to see such positive interaction and conversation occurring during this time. A reminder is given to parents that the School does not encourage extended family holidays during school time. When students go on extended holidays in school time, parents are required to provide a written note to the Head of School at least two weeks prior to the departure. It is the responsibility of the parents and students to cover all missed work during the absence. It would be appreciated if these absences during the school term be kept to a minimum so as to avoid disruption to both staff and students. Please note that the complete Attendance Policy is provided in the Parent Handbook as a ready reference. On behalf of St Joseph’s School Community, I would like to extend our sincere condolences to the Lawrence Family on the loss of their grandfather. Our thoughts and prayers are with you at this time. Next week, our Principal, Mrs Carmen Cox, will return from Leave. I am sure she has had a wonderful rest and will return refreshed. I would like to thank the School community for their support during these two weeks. A reminder is given that the second session of Parent/Teacher/Student Interviews will take place on Thursday 2 August (Week 3) between 3:00-5:45pm. These meetings will take place in the St Marcellin Performing Arts Centre with the expectation that students will attend with their parents. Please contact your child’s classroom teacher if a new booking request is required. Today, Mike from WA Squash visited the students from Year 3/4 to Year 6 to instruct them on the finer points of the game of squash. 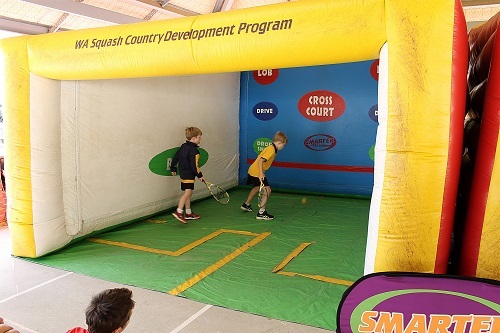 Using inflatable squash courts, the students learnt how to rally and play a basic game of squash. Lots of fun was had. Well done to our students for their enthusiastic participation. Primary students from Kindergarten to Year 6 will start the celebrations of National Science Week (Week 5) early this year and participate in a Scitech Incursion on Tuesday 31 July and Wednesday 1 August. The incursion will include a ‘Move It and Prove It’ Show and a hands-on workshop, all based around the Physical Sciences strand of the WA Curriculum. Students in Years 7 to 11 are advised that Homework Classes will be held during Term 3. Year 12 ATAR students have been allocated their own tutoring schedule. Homework Classes will be held every Tuesday between 3:15pm-4:15pm from Weeks 2 to 9. Students must obtain and return a signed permission slip, available from the Admin Office, before they can attend. Thursday night provided an opportunity for teachers, parents and students to meet and discuss individual progress and achievements over Semester One. If you missed this occasion, please contact the Secondary Admin office to arrange an alternative meeting or phone call with your child’s teachers. We congratulate Matthew Fernihough [Year 11] who is representing Australia in the Muay Thai World Championships next week in Bangkok. After winning his age/weight division in a local competition on the weekend, Matthew is certainly well-prepared for this event and the School wishes him every success. Well done, Matthew! Term 3 is the final term of school for our Year 12 students. Please keep these students in your prayers as they make their final journey at School. Your encouragement and support will be sincerely appreciated. ‘The Cloudchasers’ is a two-part children’s storybook, written and illustrated by Stephen Hunt and David Richardson. Stephen and David have kindly provided their permission for our School to adapt their books into script and to perform it live as a School production. They will be following closely as we near our production date and look forward to seeing the photos and video of the final production. ‘The Cloudchasers’ is the story of three children who set off on a quest to restore imagination to the land. Along the way, they meet various interesting characters and perform wondrous tasks. It is a beautiful story which the students will depict wonderfully. Please make sure to put this date in your diaries or on your calendars. Parents, grandparents, siblings and family friends are all invited to attend this production. We hope to see you there supporting our Years 9 and 10 Drama students with their wonderful performance. Please note that this performance is suitable for students of all ages. Attending University Open days is highly recommended for secondary students when considering their future educational options. These days showcase courses, programs, activities and facilities of a tertiary campus as well as providing the opportunity to visit a University and speak with staff and current students about courses you may find interesting. This weekend will see a number of Open days available. Year 12 students are reminded of their after-school ATAR Tutorials being held this term. Please refer to the roster contained in your letter distributed to all students last week. These tutorials provide an opportunity to consolidate understanding and enhance content delivered in class. Some of the tutorials will be using this time to go through examination style questions. Please refer to the specific teacher regarding the Room for the tutorial and any additional materials that may need required on that day. The ACC Athletics Carnival will be held on 31 August 2018 at WA Athletics Stadium. St Joseph’s staff are providing training sessions for specific events after school. It is highly recommended that students attend those training sessions for their nominated event(s) where possible. The Schedule for these training sessions has been provided to participating/nominated students. A reminder is provided to families who have elected to pay their School fees in instalments that unless you are paying by Direct Debit (DD) or another regular payment scheme, the School requires payment of the next and final 1/3rd by Friday 3 August. If you have any queries regarding your Fees Account, please contact the Business Manager on 9621 3503. The P&F is hosting a Book Fair during Book Week [Week 6]. To run this successfully, we are seeking volunteers to assist with setting up, sales throughout the week and packing up at the end of the Fair. If you are able to assist, please log into: http://signup.com/go/bjvoKLY and fill in the days and times that suit you. Alternatively, you can contact Sally Wood on 0439 941 201 or Holly Robert on 0412 210 665. The Northam Netball Association is running their NetSetGo Skills program in Term 3 for 8 weeks. 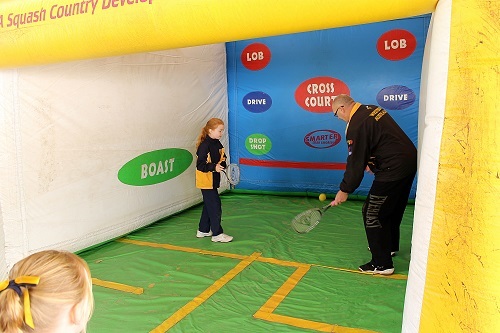 The sessions commenced on Monday 16 July and will be held at the Northam Rec Centre on Court 1 between 4.30-5.30pm. Cost is $60 per child and is open to all five and six year olds (born 2012-2013) and any 7 to 8 year olds not already playing and wishing to join in. Northam Junior Indoor Hockey matches will be held for students aged up to 14 years. Registrations for teams and players are now open. Games are held at Northam Rec Centre and will be held at 5.00pm Friday nights or Sunday afternoons - depending on numbers. Fees are $70 per player plus $2 weekly for court hire. KidSport vouchers are accepted. Junior Indoor Hockey operates under the banner of the Northam Indoor Hockey Assoc. Inc. For more details, please contact Tash James on 9574 0543, tashjames12@hotmail.com or text 0428 109 642. I will be contacting families during the coming weeks to set up the Canteen Roster for Term 3. Please also remember that any assistance is always appreciated. Even if all you have is an hour or two one morning, you are very welcome to contact me to go on the Roster.